During the past decade, Eddie Olczyk has developed into one of the top television analysts in all of sports, not just hockey. But when it was announced July 11 that the Chicago native would be a member of this year's class for the U.S. Hockey Hall of Fame, it was a reminder of how talented Olczyk was during his 16 seasons as a player in the National Hockey League. Olczyk, who will join Dallas Stars great Mike Modano and New Jersey Devils general manager Lou Lamoriello as the Hall's newest inductees at a ceremony Oct. 15 in Dallas, appeared in 1,031 NHL games during stints in Chicago, Toronto, Winnipeg, New York and Los Angeles. 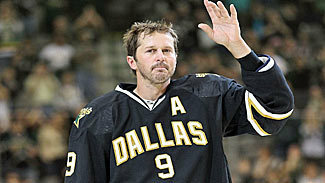 He had 342 goals and 794 points and won a Stanley Cup with the Rangers in 1994. "I'm extremely honored and humbled," Olczyk told NHL.com. "It's just something that I was hoping for, for a long time. I'd be lying if I didn't think it was going to happen at some point, but to have it happen now, it's certainly a great thrill. Everybody's really excited. It's going to be a great night and I'm just really looking forward to it." Olczyk broke into the League in dramatic fashion, selected by his hometown Blackhawks in the first round (No. 3) of the 1984 NHL Draft. Adding to what already seemed like a Hollywood script, Olczyk had 20 goals and 30 assists in 70 games for Chicago in his rookie season of 1984-85. He added 11 points (six goals, five assists) in 15 Stanley Cup Playoff contests, helping the Blackhawks reach the Campbell Conference Finals. "It's always tough -- the pressures and the expectations and everything like that," said current San Jose Sharks general manager Doug Wilson, who was Olczyk's teammate in Chicago. "But I think he handled it as well as anybody could. But I also think it's one of those things a lot of other kids would say as a role model, 'Here's one of us that grew up in this environment and went on to accomplish these things.' In the moment, it might have been challenging and difficult, but I think the end of the journey is something that inspired a lot of young players." Of being drafted by the Blackhawks, Olczyk said, "It's all I ever wanted. As a young kid, I didn't know anything about a draft, I didn't know anything about how players get to the League. All I ever wanted to do was play in the NHL and play for the Blackhawks, and I was lucky enough to do that. "As a rookie and to play my first game and score my first goal as a Hawk and then play a lot of games in between and eventually play my last game wearing a Blackhawk jersey (in 2000), it's something that as a young kid growing up in Chicago, that's what I wanted to do. I played all my amateur hockey in Chicago until I left home when I was 16. Like most kids, you have aspirations and dreams to get to that level. I wanted to play at the old Chicago Stadium because I was a fan and was lucky enough to go to a lot of the games. I've lived a lot of dreams, but certainly that was one, that as a young boy, I was hoping would happen." Remarkably, Olczyk fulfilled two childhood dreams by the time he celebrated his 18th birthday. A few months prior to being drafted by the Blackhawks, Olczyk represented the United States at the 1984 Winter Olympics in Sarajevo, Yugoslavia. Unfortunately, the U.S. team didn't come close to experiencing the success of the 1980 "Miracle on Ice" squad (the Americans won once in five tournament games), perhaps succumbing to the pressure of trying to duplicate that gold-medal winning group. "I had the great fortune of playing in the Olympics as a 17-year-old and trying to follow in the footsteps of the 1980 team," Olczyk said. "It didn't matter what we did -- we would only be able to equal what that team did in 1980. The pressure was immense. It helped being 17 years old and just playing hockey and being naïve from all the pressure and just going to play. But to get that opportunity in that sporting venue and be able to represent our country after what happened in 1980 was a great thrill. It was challenging in so many aspects and I know it helped me pave the way for my professional career -- playing an Olympic schedule and traveling and playing against the best in the world. That certainly helped me be ready for the National Hockey League." Olczyk followed his successful rookie year with a solid sophomore season, tallying 29 goals and 50 assists in 79 games. But the wheels started to fall off during season three. Olczyk's production declined dramatically in 1986-87. His goals total dropped from 29 to 16. His points fell from 79 to 51. And after spending 47 minutes in the penalty box during his second season, Olczyk racked up 119 penalty minutes the following year. That summer, Olczyk's time in Chicago came to an end. In a blockbuster trade, the Blackhawks sent Olczyk and Al Secord to the Toronto Maple Leafs in exchange for Rick Vaive, Steve Thomas and Bob McGill. Olczyk was crushed. He was leaving home. "My first two years in Chicago were good and consistent," Olczyk said. "My third year, I just did not have a good year. A lot of people talk about the sophomore season being tough for players, but my third year was the toughest. I had a lost a friend over the course of that summer, and I think just emotionally and mentally, it just started off as a rough year. I just could never get on track. "It's not an everyday occurrence to have a hometown kid be drafted in the first round and then make the team right out of high school. I felt the pressure, whether it was there or not. I wanted to do so well for so many people and for the city and for the team that I think in that third year when things just kind of went off the rails, it never came back. It was extremely disappointing. I didn't learn that the game was a business until probably that trade." The change of scenery benefited Olczyk. In his first season with the Maple Leafs, the gifted American forward erupted for 42 goals in 80 games. Still only 21 at the time, Olczyk's 75 points led his club. "When you go there and you get traded for the team captain (Vaive), there's pressure to play in Toronto," Olczyk said. "I'm a big believer that there are some players that don't have the ability to be able to play in big markets and pressurized markets. You can name every team in Canada and put them front and center with every team in the League -- there is that pressure. A lot of players don't want it. But for me, to go right in the frying pan in Toronto, looking back, to get a chance to go there and play a lot certainly allowed me to kind of spread my wings a little bit more." Wilson said, "I think what happens is you take [getting traded] personally, and I think he did need a fresh start. I think we all go through that at some point. As a player, it's not because you're a bad person. Maybe there's a different fit or a different need. Eddie's always been a wonderful person. Sometimes people look at things and say, 'Here's what's wrong ' or 'Here's what's not working' instead of maybe the other team wanted something or needed something or maybe the organization was in a different cycle or needed different things. All I know is Eddie never changed as a person, which is really the real measure of a man." "It's not an everyday occurrence to have a hometown kid be drafted in the first round and then make the team right out of high school. I felt the pressure, whether it was there or not. I wanted to do so well for so many people and for the city and for the team that I think in that third year when things just kind of went off the rails, it never came back." Olczyk spent three full seasons in Toronto before he was traded again, this time to the Winnipeg Jets 18 games into the 1990-91 campaign. Again, a change helped his production -- Olczyk had 57 points (26 goals, 31 assists) in 61 games. He would score 32 goals in 64 games the following season, but was traded to the Rangers during the 1992-93 season in a deal that sent enforcers Kris King and Tie Domi to the Jets. It was in New York where Olczyk fulfilled another dream. Though he didn't put up the numbers he did in his previous three stops, Olczyk won his lone Stanley Cup championship with the Rangers in 1994. He appeared in one game that postseason but learned a lot about being a winner. "You don't realize how hard it is to win until you actually attain it," Olczyk said. "The expectations that we had and the year before of not making the playoffs and then coaching changes and all the moves and the trades at the deadline, the one thing we had was chemistry. Whether it was our big guys or it was our extra guys like myself, there was chemistry. Everybody had a role and players have to do two things -- accept and execute. To have been able to be a very small part of that, it made me realize just how hard it is to win at this level. I took that with me. It was just a boatload of fun." Olczyk was dealt back to Winnipeg during the 1994-95 season and stayed with the franchise until it played its final game in April 1996. Olczyk, who gave an emotional speech on the ice at Winnipeg Arena that night, was thrilled to see NHL hockey return to Manitoba last October. "The Peg was a real special place," Olczyk said. "The one thing we always tried to take pride in as a family was we always became entrenched in the community. I had a special tie with Winnipeg, not only the first time, but after I came back from New York and being there for the last season back in '96. It was another place that they eat, breathe and sleep hockey. There's so many great people. I enjoyed it very, very much. It was just a great experience. A lot of relationships have continued from our days in The Peg. "I felt for all of those people. Once the team came back, I couldn't have been more pleased. I still haven't been back for a regular-season game yet, but I'm hoping at some point to go back and remember what it was like back in '96." Olczyk had three more stops in his playing career, seeing time with the Los Angeles Kings and Pittsburgh Penguins before returning home to Chicago, where he retired in 2000. Including Stanley Cup Playoffs, he finished with more than 350 goals and appeared in almost 1,100 games. Monday, the 46-year-old will be rewarded alongside two men who also achieved tremendous amounts of success. "I'm just not going in with two American hockey icons, but I'm going in with two hockey icons exclamation point tripled over," Olczyk said. "I've known Mr. Lamoriello since the summer of '83 and our paths have crossed in a lot of different ways. To be going in with him is certainly so gratifying. Playing on I think three different teams with Mike Modano for the U.S. and him being the greatest American-born scorer in the League, it's certainly a great thrill and a super big honor."